← Curiosity update: We have sample! Chryse Chaos. 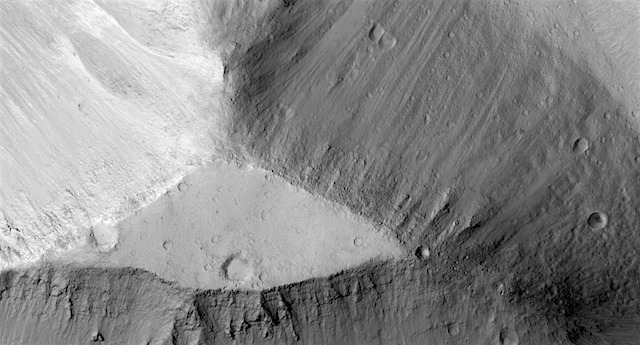 In planetary nomenclature, the term chaos means “distinctive area of broken terrain.” The general morphology of chaos is steep-sided mesas in close proximity. The interconnected channel forms erode, and mesas are created by erosion of the bounding channels. This entry was posted in Reports and tagged Beautiful Mars, chaos, chaotic terrain, Chryse Chaos, High Resolution Imaging Science Experiment, HiRISE, Mars Reconnaissance Orbiter, mass wasting, MRO, NASA, University of Arizona. Bookmark the permalink.